As with several of its post-war RAF contemporaries, the Hunter was never called on to perform its designated role as an airborne interceptor in anger, apart from minimal service during the Suez campaign of 1956, and was expected to be withdrawn from front line service during the early sixties as its replacement, the Lightning, entered widespread service. Indeed that would have undoubtedly been the case had it not been for an urgent requirement to find a replacement for the elderly Venom FB.4s still operating in the fighter/ground attack role in a number of overseas theatres. As the highest priority was in the Middle East a series of trials, known as the Venom Replacement Evaluation Trials (VRET), were conducted in August 1958 in Aden using the airfields at Khormaksar and Riyan as the main trials bases. Using the unsurfaced runway at the latter also provided the opportunity to compare each aircraft’s performance from both tarmac and compacted sand runways. One of the major contenders at the trials was a Folland Gnat F.Mk.1 (a brand new Indian Air Force production aircraft IE1064, temporarily reserialled XN122, equipped with a special cold air unit for the air-ventilated suit and special low pressure mainwheel tyres), flown out to Aden in an RAF Beverley, along with technicians who reassembled it and provided support for the duration of the trial. Lined up against it were the last two production Hunter F.Mk.6s to enter RAF service, XK150 and XK151, each fitted with a tail braking parachute and flown out to Aden from West Raynham. The Hunter had originally been considered uneconomical for the conditions it would experience in the Middle East but, following a bout of lobbying by Hawker Aircraft, it was given permission for the aircraft to participate in the trials. The final participant was an early production Jet Provost T.Mk.3, XN117, modified to carry machine guns and bomb carriers. It was rank outsider from the start and, apart from its low cost of operation, it did not perform any of the operational tasks to the required standard and was subsequently eliminated. The trial directive contained eight objectives, covering general performance, ferry and strike range, weapons capabilities, take-off and landing distances on the surfaced runway at RAF Khormaksar and an unprepared airstrip at Riyan, cockpit environment, ability to defend itself after interception and vulnerability to ground fire. During the trials, the aircraft were flown over all types of terrain, under high ambient temperatures and varying altitudes, against each other and a Venom from 8 Squadron. The two Hunters and the Jet Provost were flown by pilots from the Air Fighting Development Squadron at the Central Fighter Establishment, and full ammunition loads were carried in each aircraft on all sorties. Ground-level attacks were carried out on various targets located on the flat desert plains and the mountainous terrain in the hinterland of the Protectorate. It was found that against the Hunter and Venom at altitudes of 40,000 feet, the Gnat out-climbed both aircraft with ease and could also out-turn the Hunter. In addition, the Gnat’s excellent ceiling, rate of climb and rate of turn, and its very small size, made it a impressive adversary in the fighter combat role and in these respects was superior to the competing aircraft. Furthermore, because of its high speed and very small size, it was very difficult to see and, therefore, less vulnerable to ground fire. During the trials, it was determined that a minimum amount of ground equipment was required to produce excellent serviceability for the Gnat under adverse conditions, but it did require an external source of pressurised air to start the engine. Having proved itself a good combat fighter, the Gnat was found to be deficient in several important aspects when measured against the operational requirement. When operated from the very rough, unsurfaced runway at Riyan, for example, the take-off in the aircraft was accompanied by an unnerving pitching motion, with the nose oleo audibly bottoming, and a reluctance for the nose-wheel to lift off when the stick was moved fully back at 130 knots IAS. Other problems noted during the tests at this remote base included the blasting away of the top surface from the runway by the low jet efflux during the take-off run, and serious damage to the braking parachute canopy caused by debris being thrown up by the jet efflux and the narrow track of the main undercarriage made landings unsteady.  One of the major requirements the Gnat could not meet, however, was that of range. In the strike configuration, it was capable of flying a radius of action of 188 nautical miles (n.m.) instead of the stipulated 240 n.m., and its maximum ferry range, at 673 n.m., was insufficient to enable it to fly the between some MEAF bases without refuelling at least once and probably twice. The evaluation team concluded that major improvements would be needed to the Gnat’s capability as a ground attack, rocket and gun firing platform before it could be considered for the role in the Middle East. Apart from the capability of the Gnat to out perform the Hunter in an air combat role, it was the Hunter that triumphed in every aspect when it came to ground attack and it was the aircraft selected to replace the Venom. 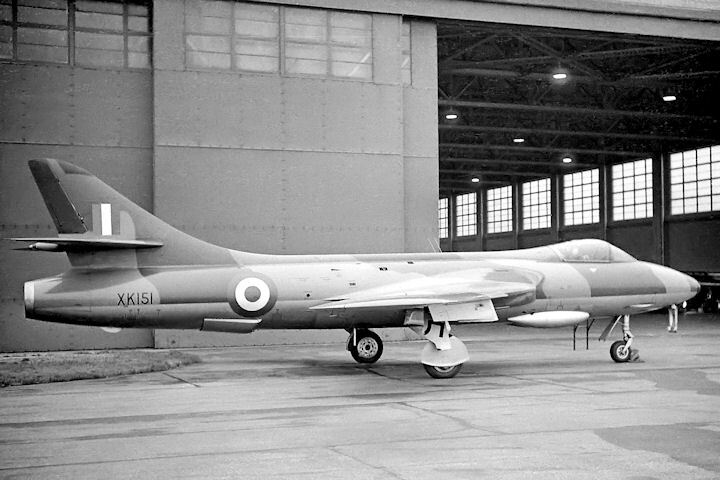 In the following year work commenced on the prototype conversion of an F.Mk.6 to the new ground attack version, the FGA.Mk.9, and in this guise, XG135 took to the air for the first time on 3 July 1959. Powered by a Rolls Royce Avon 207 engine rated at 10,150 lb thrust and with a fully tropicalised refrigeration and ventilation system and an increased oxygen supply, the full Mark 9 configuration was first tested on this aircraft. Contracts were placed for the conversion of a further thirty-six F.Mk.6 airframes, the work being carried out by RAF and Hawker teams at Horsham St Faith. This batch was fitted with a lower rated Rolls Royce Avon 203 and having only partial modification to Mark 9 standard, were termed ‘Interim Mark 9’. Five follow-on contracts brought the total number of conversions from Mark 6 to Mark 9 to 128, culminating with a final batch of nine from 5 MU at Kemble in 1965. The devastating fire-power available from the four 30 mm nose-mounted cannon was retained and a strengthened wing enabled the FGA.9 to carry a multitude of ordnance, including 1,000 lb or 500 lb bombs on the inner drop tank pylons if needed, but the standard fit in the Middle East was for three Mk.12 rocket rails to be fitted under each wing, each capable of accommodating three 3” rockets (known as drainpipes dating back to the second world war). In order to satisfy an increasing demand to quickly reinforce distant campaign theatres and flexibility within the MEAF area, the specification was further enhanced to enable the aircraft to carry a pair of 230-gallon tanks on the inner wing pylons. This necessitated the cutting away of a portion of the landing flaps, the outboard corner on each being sculptured in an arc. The aircraft could be used in combat with these tanks fitted, following the incorporation of a modification featuring the fitting of bracing struts between the tanks and underside of the wings. The RAF now had one the most potent ground attack fighters in its history and it was to put it to good use. 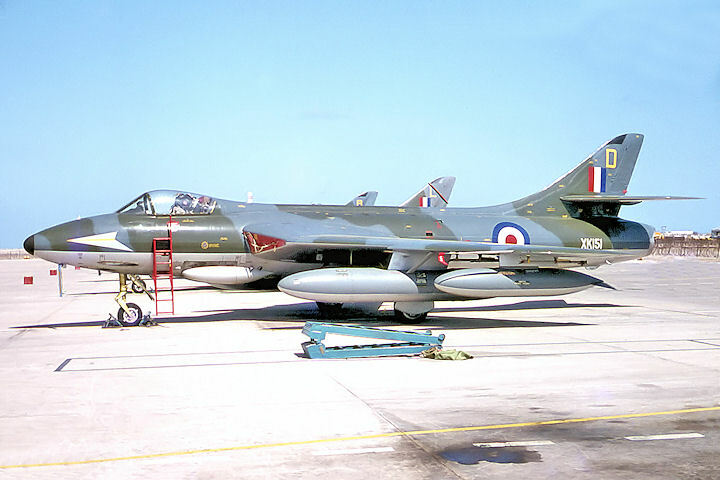 Suitably modified, twelve Hunter FGA.Mk.9s entered service with 8 Squadron at RAF Khormaksar, Aden, in January 1960. Among them were the two VRET trials aircraft (XK150 and XK151), the prototype Mark 9 (XG135), and one other interesting aircraft, XE600. Following trials with nosewheel braking it was converted to F.Mk.56 standard for the Indian Air Force but it refused to accept it. XE600 was returned to Hawker’s for conversion to FGA.Mk.9 standard for the RAF. Over the next two years, the Mark 9 equipped a further seven squadrons, Nos. 1, 20, 28, 43, 54, 66 and 208. Numbers 1, 54 and 66 Squadrons operated from bases in the UK, 1 and 54 being assigned to the newly formed No. 38 Group, 20 Squadron was based in Singapore, 28 in Hong Kong, 43 in Cyprus and 208 in Kenya. Except for odd detachments abroad both 38 Group squadrons remained on home soil and were seldom called upon to discharge their ordinance over enemy territory. A similar situation existed in Hong Kong, where 28 Squadron spent much of its time flying low over the sea seeking out arms smugglers and No. 20 Squadron’s Hunters were often called upon to attack targets in the Malay and Borneo jungles in support of ground forces during the troubles out there. Number 66 Squadron disbanded in September 1960 having operated the Mark 9 in the UK for some six months only. 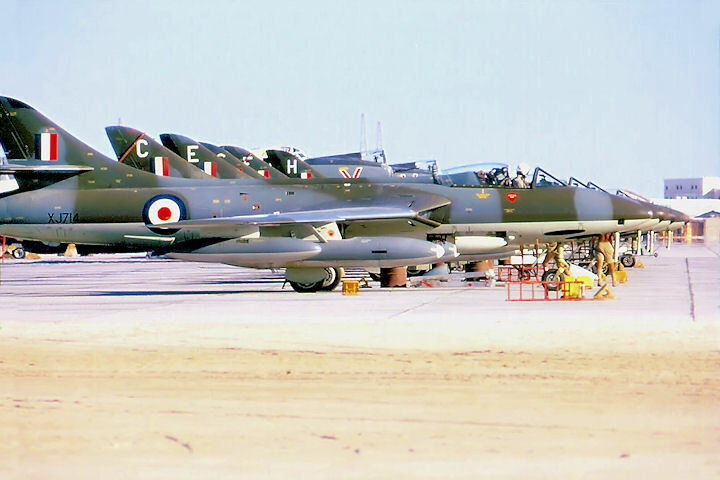 The major theatre in which the Hunter Mark 9 saw consistent action in RAF service, however, was in the Aden Protectorate with the Middle East Air Force. Here it remained until the end of 1971, when 8 Squadron disbanded as the last unit to operate the Hunter in front line service. The 230-gallon drop tank designed for the Hunter was developed in three phases. With no strengthening struts and comprising a single chamber, for use on ferry flights only. A strutted version where the tank remained single chamber, allegedly specified for the full flight envelope.